Kickflip, grind, manual, and combo your way through the streets of Los Angeles in Epic Skater. This free skating game will keep you coming back for more as you master dozens of tricks that combine into endless combos. 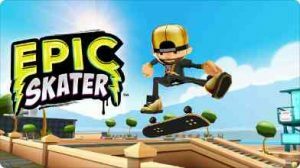 Epic Skater has something for everyone as you compete on distance, biggest combo, or highest total score. Play the way you want. PLEASE NOTE: Epic Skater is completely free to play, but some in-game items can be purchased for real money. If you don’t want to use this feature, please disable your device’s settings. More than 25 unique tricks that combine into millions of gnarly combos. Trick over monster gaps for big points. Upgrade your stats to jump higher, grind faster, manual longer, and more! Level up your skater to multiply your score into the stratosphere. Skate the furthest, combo the biggest, or maximize it all to truly be an Epic Skater. An update to my undeniably best skateboarding game in the App Store. Thank you guys for listening to your player base. That is the most important thing to players, and the most respected. I love the two recent new spots. They help break up extended durations at spots that can get boring especially in a distance game. That is something of the past now! I am now having more fun. Looking forward to future updates! Thank you Kongregate for developing an awesome skating game I’ve enjoyed and still do for a couple of years!